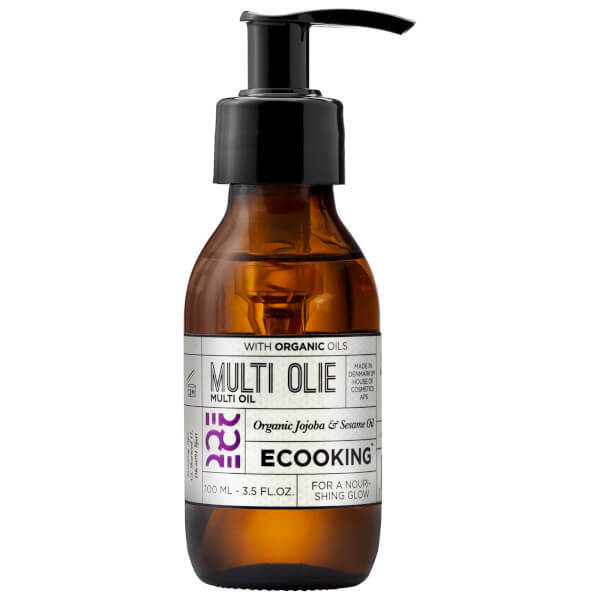 Discover the benefits of Ecooking Multi Oil; a multi-purpose formula that utilises 100% organic oils and essential fragrance extracts from Orange and Lavender. Combining Jojoba and Sesame Oils, the luxurious blend can be used on the face, body and hair, and is suitable for men and women. Ideal as a nourishing hair oil, a conditioning scalp treatment, a face and eye makeup remover, or a massage oil. Always to be used on damp skin and hair. It may also be used on dry hair to give more shine. If doing so, put a small amount of oil into the palms of your hands and swipe over your hair from the scalp to the tips of the hair. Gather the tips and “wipe” the last bit of oil into the hair. When cleaning your skin, put the oil onto a damp cotton pad and cleanse. Use the same procedure for removing eye makeup. When shaving, dampen your skin with lukewarm water and apply oil to the area you wish to shave. Wait a minute and let the oil penetrate your skin in order to soften the hairs (1-5 minutes). Shave normally with a shaver. In this way, you avoid in-grown hairs, beard plaque and dry, flaky skin. When done shaving, apply a small amount of oil to the area. Sesamum Indicum Seed Oil*, Simmondsta Chinensis Seed Oil*, Essential Oils**, Geraniol**, Citronellol**, D-Limonene**, Linalool**.